Birthplace : Central Bridge, New York, U.S.
George Westinghouse, American inventor and manufacturer, made substantial contributions to railroad transportation safety and efficiency and to the transmission of electrical power. George Westinghouse was born in Central Bridge, N.Y., on Oct. 6, 1846. After working in his father's machine factory in Schenectady, George served in the Union Army during the Civil War and then attended Union College for a short time. He received his first patents in 1865. His rotary steam engine proved impractical, but the car-replacer he designed to restore derailed cars to their tracks was successfully marketed. Westinghouse laid the basis for his fortune when he patented his first air-brake invention in 1869 and organized the Westinghouse Air Brake Company. A number of patented improvements followed, including the truly revolutionary automatic air brake for trains (1872). He also worked to make all air-brake apparatus standardized and interchangeable and later developed a complete signal system for railroads. He formed the Union Switch and Signal Company in 1882. Early in the 1880s Westinghouse applied his knowledge of compressed-air problems to the new natural-gas industry and patented several devices for the transmission and measurement of natural gas. This work in turn enabled him to comprehend the problems involved in distributing electrical power. An early convert to alternating current, he acquired European patents covering single-phase alternating-current transmission and organized the Westinghouse Electric Company in 1886. The company soon acquired the rights to a new polyphase alternating-current motor designed by Nikola Tesla and thus was equipped to produce power for both lights and motors. Westinghouse successfully advocated the alternating-current system, and in the early 1890s he received contracts to light the World's Columbian Exposition in Chicago and to develop a power system at Niagara Falls. An incredibly prolific inventor, Westinghouse obtained an average of more than a patent a month during the 1880s. Among his most significant inventions were the friction gear, geared turbine, and air springs. He lost control of the Westinghouse Electric and the Westinghouse Machine companies in the business crisis of 1907, but his reputation for integrity and wisdom was such that he was one of three trustees appointed to reorganize the mammoth Equitable Life Assurance Company after its collapse at the same time. He died in New York City on March 12, 1914. 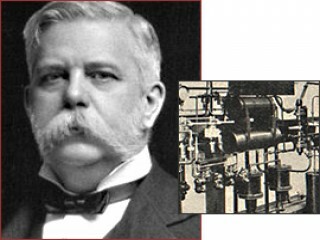 View the full website biography of George Westinghouse.